Home » Food and Nutrition » Does a Food’s Texture Change Its Nutritional Value? Do you like your snacks crispy and crunchy, or soft and gooey? Does it make a difference when it comes to calories? According to a new study, it appears texture plays a big role in how people perceive the health value and caloric content of food. Research shows people tend to believe it’s healthier—and a better option when trying to monitor calories—if food is rough and crunchy. A softer, gooier option is seemingly associated with higher calories; people tend to eat less of these foods as a result, according to a recent report published in the Journal of Occupational and Organizational Psychology. Researchers put participants through a series of tests to track how they perceive texture, the amount they eat, how the food feels in their mouths, and how many calories they associate with foods of varying textures. For example, one experiment had participants sample food that was hard, soft, smooth, or crunchy; they were then asked to estimate the caloric amount per item. For the most part, calories for each of the samples were overestimated, but soft and smooth options were perceived as having an average of 55% more calories than the crunchy foods. Another study asked people to watch and rate television ads, which they thought was the study. They were provided a cup with either soft or crunchy brownies as a “thank you” for their participation. Half of the participants were asked how many calories they thought were in the brownies. The participants who were asked about the calories ate more crunchy brownies than soft, likely because they had calories on their mind. The group that was not asked to monitor calories ate more of the soft ones. The hard and soft brownies, however, both contained the same amount of calories. 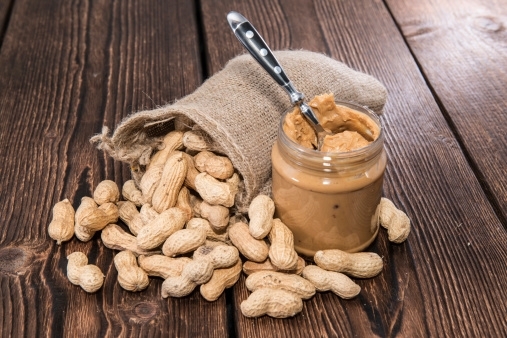 Natural peanut butter, for example, has the same amount of calories, fat, protein and carbohydrates per serving regardless of whether it is crunchy or smooth. It’s possible that crunchy foods (or foods with pieces in them) are perceived as healthier because they may be associated with being a more “natural,” less sugary option than smooth alternatives. This is often not the case, but it does provide some insight on how people make decisions about what they eat and how they perceive nutritional value. The best way to accurately assess the calories in what you’re eating is to make a habit of reading nutrition labels. These labels provide you with facts about what’s in your food to help you make wise choices. Remember: just because something might look healthy or light, that doesn’t mean it is. Lindenmuth, K., “How Food Texture Influences Your Calorie Intake,” Women’s Health web site, April 21, 2014; http://www.womenshealthmag.com/weight-loss/food-texture. “Crunchy or Smooth? Food’s Texture May Sway Perception of Calories,” National Institutes of Health web site, April 16, 2014; http://www.nlm.nih.gov/medlineplus/news/fullstory_145711.html.